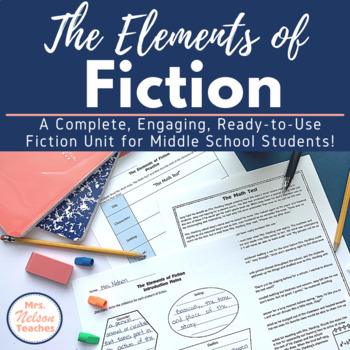 A Complete Fiction Unit - Great for Middle School Students! One of the most exciting topics to share with students is the elements of fiction! Kids love it and we love it! 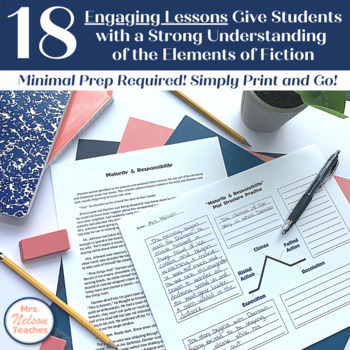 This unit brings the characteristics of literary fiction to life for students through fun and engaging Power Point presentations, handouts, assignments and activities. 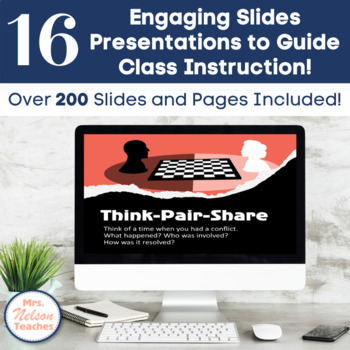 This unit includes a variety of Power Point presentations, note sheets and assignments to be used to teach students about the Elements of Fiction. Topics covered in this unit include: types of characters (protagonist, antagonist, dynamic, static, major, minor); Characterization (indirect, direct and STEAL); setting (why setting is important to the story); mood; conflict (types of conflict: internal/external man vs. man, self, nature, society, machine); point-of-view (1st person, 3rd person limited and omniscient); theme (with steps to find them in a story); plot structure (exposition, rising action, climax, falling action, resolution). Each topic has a Power Point presentation to teach key concepts and provide examples, along with handouts for each. An end-of-unit test is also included to help measure students' learning. All documents can be modified to best suit your students and your own specific learning goals. Aligns with Common Core Reading Literature curriculum standards! ***Looking for more great units to support your curriculum?? Check out these products! !